Canada's financial system remains resilient, according to the Bank of Canada, but high household debt and imbalances in the housing market remain the biggest vulnerabilities. Canada's financial system is resilient, according to the Bank of Canada, but high household debt and imbalances in the housing market remain the biggest vulnerabilities. In its twice-a-year Financial System Review, the central bank said that these vulnerabilities "remain elevated," even though policy measures have started to make an impact. "The vulnerability related to high household indebtedness has begun to ease. Incomes continue to rise and household credit growth has slowed due to higher interest rates and policy measures aimed at mortgage financing and housing," the bank said in a statement on Thursday. "Because of the sheer size of the stock of debt, however, this vulnerability will persist for some time." The Bank of Canada has raised interest rates three times since July last year and is expected to make another hike at its policy meeting next month. But Royce Mendes, senior economist at CIBC Capital Markets, said that after an increase to the benchmark interest rate in July, the central bank will likely take a more gradual approach going forward. "We see them [interest rates] settling in Canada at lower rates than they have in past cycles, simply because you need fewer interest rate hikes this time around to cool the economy, just because they are so much more powerful because of the large stock of outstanding debt," he told the CBC. Paul Ashworth, chief North America economist at Capital Economics, took it a step further, saying the slump in the housing market will lead the country's economic growth to slow to 1.7 per cent this year and to only 1.3 per cent next year, forcing the Bank of Canada to start cutting interest rates again. "The housing downturn continues to weigh on consumption and residential investment," he said in a note. "That weakness will eventually force the Bank of Canada to begin cutting interest rates again from next year onwards." Meanwhile, even though house price growth has slowed, led by declines in the Greater Toronto Area, the bank said condominium markets in the Toronto and Vancouver areas remain strong, with "some evidence of speculative activity." "Overall, the vulnerability associated with housing market imbalances has shown signs of lessening but remains elevated," the bank said. 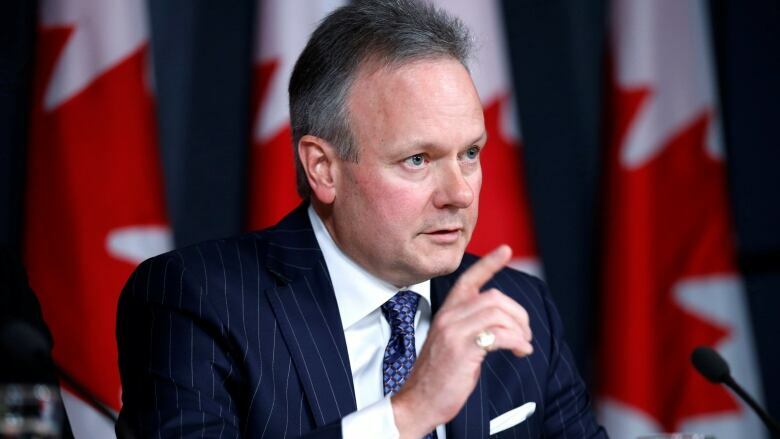 Central bank governor Stephen Poloz added that policymakers have been closely watching the "two main vulnerabilities" and are encouraged by signs of easing. Added to that, the bank highlighted that cyber attacks are the third biggest threat facing an "interconnected financial system." It said the central bank has been working with major banks and Payments Canada to ensure that key payment systems are able to recover quickly from cyber attacks. "Continued collaboration and a greater pooling of resources are needed to increase the overall resilience of the financial system," said Poloz. The warning over cyber attacks comes after two of Canada's biggest banks — Bank of Montreal and Canadian Imperial Bank of Commerce (CIBC)-owned Simplii Financial — revealed last week that the personal information of tens of thousands of customers may have been stolen by hackers. Both banks said they were working with authorities on the matter.